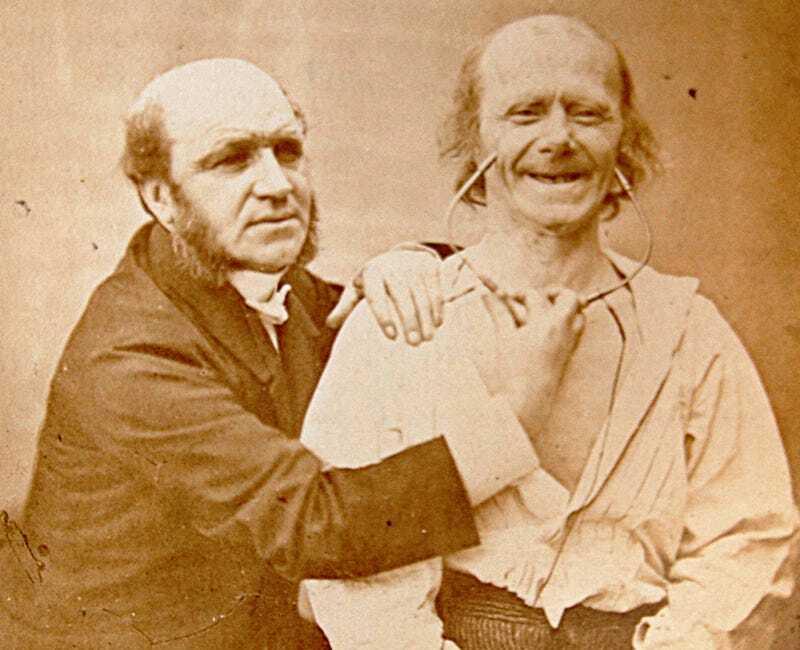 Guillaume Duchenne didn't use the Joker's extreme methods to make people smile — but he did employ a technique that was nearly as gruesome. This nineteenth century researcher was fascinated by finding a "genuine" smile — and wasn't averse to using electrodes on people, to achieve his goal. In 1806, a young fisherman's son was christened "Guillaume-Benjamin-Amand Duchenne," so right away he had a grudge with the world. Most of the time he sublimated his smoldering rage, and did good work in the burgeoning field of neurology. Those who have undergone deep tissue biopsies will have to give (grudging) thanks to him. Sometimes his deep resentment of all mankind bubbled to the surface. When it did, he rounded up poor volunteers, grabbed some batteries or a Faraday coil, and started doing research into electrophysiology. Duchenne started zapping all along people's bodies, until he'd mapped out how current traveled along the human form. After he'd established that map, he isolated muscle groups and concentrated on activating the most complicated and readable of all muscle groups: the facial muscles. Duchenne photographed the results of most of his shocks, and so collected an extensive gallery of gruesome expressions. He would hit one half of the face while leaving the other half relaxed. He'd catalog different groups of muscles, that worked in different expressions, and tried to combine them. He's most famous, though, for his work on smiles. The "Duchenne smile" is a genuine one, one that seems happy and friendly. It's the result of two different groups of muscles working together. Cheek muscles turn the lips up in a voluntary maneuver that can be faked. But the muscles under your eyes that crinkle the skin to the outer side of each eye are involuntary, and they don't necessarily start working just because you need to make a good impression at a job interview. Only the two combined really look genuine. When you smile with just your lips, you look like you're either faking or in pain. Duchenne was never able to produce a "Duchenne smile" with electrodes. To create complicated facial expressions, zapping the face usually proved fruitless. Getting each muscle to contract the exact amount at the exact same time just wasn't possible. The Duchenne smile has been mythologized for years. Studies came out saying that Duchenne smiles were hard to simulate, and that eighty percent of the population couldn't produce one, even if coached. A study of women's college yearbook pictures showed that those with Duchenne smiles were happier, even thirty years after college was out. Baseball players with Duchenne smiles in their professional pictures were half as likely to die in any given year than those without Duchenne smiles. Lately, though, the tide is beginning to turn. In a study published in 2009, scientists found that over eighty percent of the population were able to fake Duchenne smiles for pictures. When volunteers looked at pictures they were not likely to pick out the fakers. It was only when video was introduced, with its shift in facial expressions and reliance on timing, that people were able to spot the non-Duchenners. The soul doesn't show through the eye(crinkles) as plainly as we imagine. Maybe a modernized version of Duchenne's electrical devices might be able to pull off a fake smile. Anyone care to volunteer? Via PsychNet, Scientific American, Psyblog, and Encyclopedia Britannica.